There are many local attractions around Manor Farm B&B accommodation. Stay over for a long weekend and try some more exciting places to visit and things to do. The historic city of Lichfield with its beautiful Cathedral is within easy reach. Our closest major attraction is the National Memorial Arboretum which comprises 150 acres of trees and memorials devoted to the concept of Remembrance. 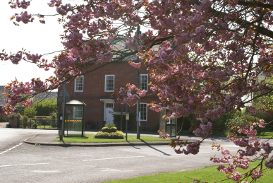 Nearby is Catton Hall which has a fascinating history and collection of pictures, furniture and memorabilia. Rosliston Forestry Centre. Would you like a quiet woodland walk, fishing trip, or a meal in the restaurant? Try out the play area, cycle routes or crazy golf if you feel more energetic! Education and events programme for pre-booked groups. Entrance to site is free although there may be a charge for some activities. Barton Marina is a short drive away. It is situated on the Trent & Mersey canal, a truly wonderful place to explore. It is not only the home to some fantastic eateries but also boasts super shopping and fabulous walks around the lakes and woodlands. Just over 4 miles away is Moira Furnace Museum. A 19th century blast furnace with interactive displays and guided tours. Boat trips are available on the Ashby Canal. Craft workshops and country parks. While 8 miles away is Lichfield Cathedral and the City Dungeons. Just a short hop away from Tamworth is Drayton Manor Theme Park, one of the biggest family theme parks in the UK. Please feel free to ask us any questions on any local attraction. We are here to help you relax and have a relaxing break at Manor Farm bed and breakfast.